keeping your garbage disposal working efficiently does not take a lot of work and it is not rocket science. With a little bit of routine maintenance it will work effectively and you will need less professional Garbage Disposal Replacement in Queen Creek, AZ. Follow these tips to keep your disposal working correctly. Your garbage disposal is not a trash canister and should not be treated like one. Majority of problems causing garbage disposal repair and garbage disposal replacement include shoving too much into the garbage disposal and putting things that don't belong into it. Certain things should never be put into your garbage disposal and these include bones, meats, foods that expand and non-food products. Treat your garbage disposal right so it will continue to work for you. Keeping the blades of your garbage disposal sharp will help chop foods up small enough to keep them from clogging your drains or tearing up your garbage disposal. In order to sharpen the blades you have two options. One option is to put a filter full of coffee grinds into your disposal and turn it on. The grinding noise means that it is working, and the second option is to use ice cubes in it. The biggest way to avoid problems with your disposal and avoid garbage disposal repair is to run water while you are using the garbage disposal. If you do not run water while using the disposal the teeth work harder to chop up the food. 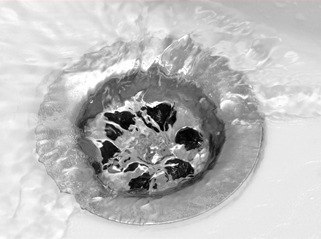 Cold water helps to move the food through the drain holes in your disposal. Follow these tips to ensure that you disposal continues to operate efficiently. Remember to never put your hand inside the drain where your disposal is located. Call our Garbage Disposal Replacement in Queen Creek, AZ today!